Nationalization (націоналуізація; natsionalizatsiia). A national government’s act of assuming control or ownership over the means of production and other property. The terms of nationalization may vary from full compensation for the original owner to outright confiscation. In the second half of the 19th century the socialist movement in Europe and in Ukraine demanded that the largest industries and banks be nationalized. There was little agreement within the movement on the extent of nationalization and on the degree of compensation to the former owners. During the Revolution of 1917 the demand for nationalization as a means of asserting control over key sectors of the economy became widespread. The Central Rada moved toward nationalizing certain sectors of the economy. In the Third Universal of the Central Rada it abolished private land ownership by nonpeasants and empowered land committees to redistribute the lands concerned. The Fourth Universal and the Land Law of 31 January 1918 invested the Central Rada with supreme control over all land, abolished private ownership of land, and entrusted land committees with redistributing the land according to a consumption and labor formula. In their decrees the Central Rada and the Directory of the Ukrainian National Republic proclaimed state and workers’ control of production, trade, and banking but stopped short of full nationalization. Neither the Rada nor the Directory had the power to implement the acts, especially those dealing with industry and banking. In general, Ukrainian leaders accepted social democratic principles and intended to build a mixed economy. Widespread nationalization without compensation was implemented by the Bolshevik regime in Ukraine. The policy was motivated in part by communist ideology, which rejected the market and money mechanism in deference to planning in terms of physical targets. It was also a response to the economic dislocation brought on by revolution and civil strife. The Provisional Government under Aleksandr Kerensky had established a centralized system headed by the Economic Council and its executive branch, the Supreme Executive Committee. After taking power the Bolsheviks transformed this committee into the Supreme Economic Council. Vladimir Lenin toyed with schemes of a mixed economy and co-operatives until workers’ control committees posed a political threat to the local Bolshevik-controlled soviets and compelled Lenin to nationalize industry, on 28 June 1918. Many of the measures taken by the Bolsheviks in Russia were applied automatically to Ukraine. 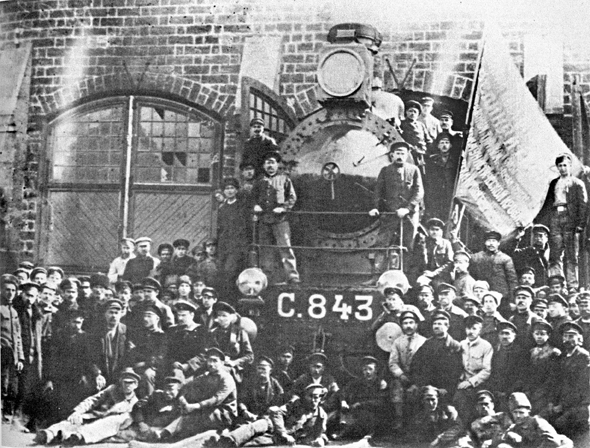 Industry in Ukraine began to be nationalized in Donetsk, in January 1918. Nationalization was carried out in stages and was not always orderly. In the first period workers’ control over many enterprises was asserted. Although encouraged at first by the Bolsheviks, that development was resisted later, and enterprises were placed under the control of regional soviets and organs of the state, such as the Supreme Council of the National Economy of Ukraine. The various sectors of industry were not nationalized at the same time, and since Bolshevik power in Ukraine was unstable, not all areas were affected equally. By 1920, however, all the main branches of industry were owned by the state. The need for supplies during the struggle for Ukraine was a major factor in the Soviet government’s decision to institute complete nationalization. By 1920, 11,000 enterprises, employing 82 percent of Ukraine’s industrial workers, had become the property of the state. In 1939–40, when Western Ukraine came under Soviet occupation, all its industry was nationalized. The first Soviet government of Ukraine, formed in December 1917, nationalized all land and allocated it for use by the peasantry. When collectivization was launched in 1929, the peasantry lost the right to individual use of the land. They retained the right to the use of small plots, which were the property of the state. The nationalization of land in Western Ukraine was implemented by the Soviet regime in 1939 and 1940. Forests and all natural resources were nationalized in 1918 and, more extensively, in 1923. Similar measures were carried out in Western Ukraine in 1939–40. Banks and all other credit institutions were nationalized in Central Ukraine in 1919 and in Western Ukraine in 1939. All large retail and wholesale trade companies were nationalized as early as 1918. During the period of the New Economic Policy small private enterprises (primarily in trade and commerce) were allowed to operate. In 1925–6 private capital in Ukraine accounted for only 6 percent of the total industrial output and 23 percent of trade. With the introduction of the First Five-Year Plan the drive to nationalization was resumed. From the 1930s private ownership in the Union of Soviet Socialist Republics was restricted to housing and to articles of personal use. In the few years before the dissolution of the USSR, the economic crisis spurred efforts to revive private property. In 1990 a law establishing the right to private property was under consideration, and private companies, called co-operatives, were encouraged by the government. The sale of nationalized industry to its employees, and of smaller retail concerns to private individuals, was being contemplated. But the denationalization of the economy failed to materialize before the USSR ceased to exist.